Most people know burdock’s most significant contribution to society as the inspiration behind Velcro. After noticing that the burrs from the plant sticking to his dog, a Swiss inventor removed one and studied it under a microscope uncovering the hook and loop structure that would eventually become Velcro. 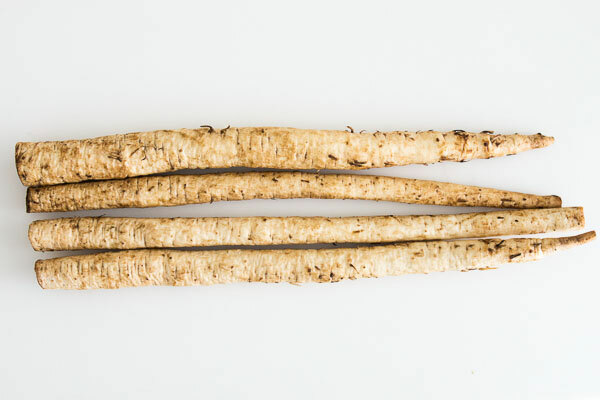 But in Asia, burdock roots (and even the stems and leaves) are a staple food and herbal medicine that have been consumed since ancient times. I love the fibrous crunchy texture and strong earthy flavor, and one of my favorite ways to enjoy it is in a salad. In addition to a ton of fiber, burdock is rich in vitamin B6, magnesium, manganese, and potassium. Burdock contains a compound that oxidizes to form tannin-iron complexes which is why it discolors very quickly when exposed to air. To prevent this, it’s important to keep it submerged in acidified water from the moment you start peeling it, until you start cooking it. To make this salad I thinly sliced the burdock and lightly boiled it, which cooks it while preserving its texture. 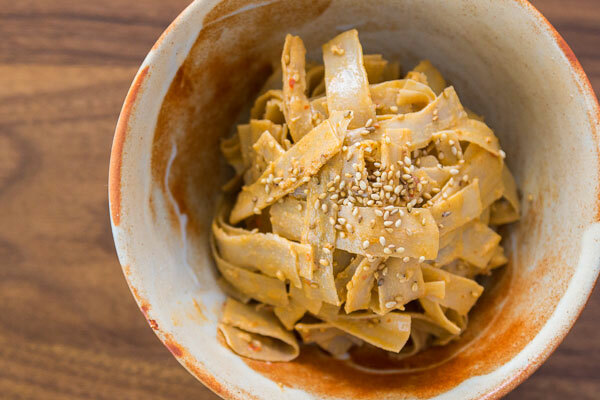 The dressing is made with rich, creamy tahini, flavorful toasted sesame oil, and crunchy whole toasted sesame seeds. It’s a nutty trifecta that not only compliments the earthy flavor of the burdock; it compliments its nutritional value as well, with additional fiber, protein, thiamin, copper, and phosphorous. 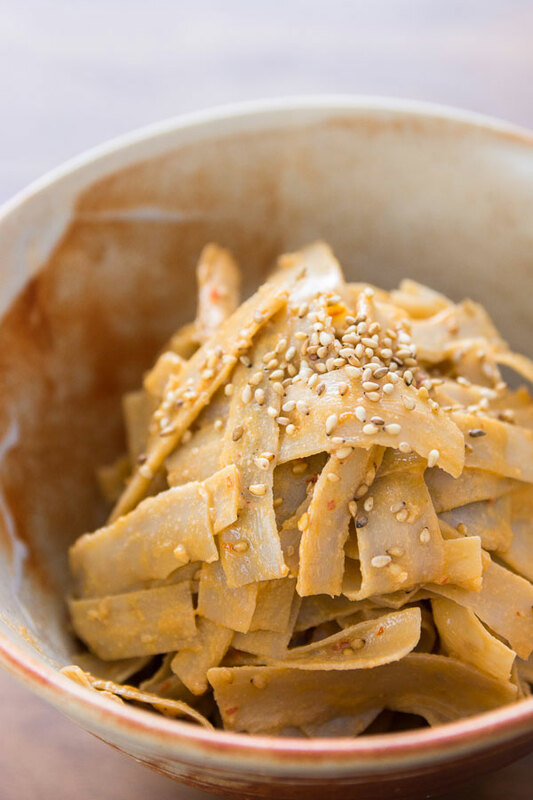 This burdock salad recipe with three sesame dressing has many healthy minerals and an earthy flavor. 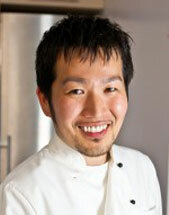 Food blogger Marc Matsumoto share what product that burdock actually inspired in a full post on the Fresh Tastes blog. In a large bowl add 1 tablespoon of vinegar and fill the bowl with water. Peel the burdock one at a time, trim the ends, and cut them into 3” lengths. Put the pieces into the acidified water immediately. Repeat with the rest of the burdock. Use a mandolin or sharp knife to slice the burdock into very thin ribbons, adding the sliced burdock back into the bowl of water as you work. Put a pot of salted water on the stove and bring it to a boil. 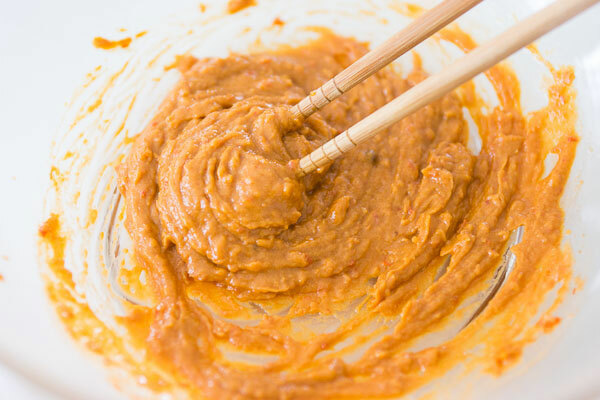 While you wait for the water to boil, add the tahini, toasted sesame oil, toasted sesame seeds, soy sauce, brown sugar, Doubanjiang, rice vinegar and grated ginger into a large bowl and whisk together. Drain the burdock and add it to the boiling water. 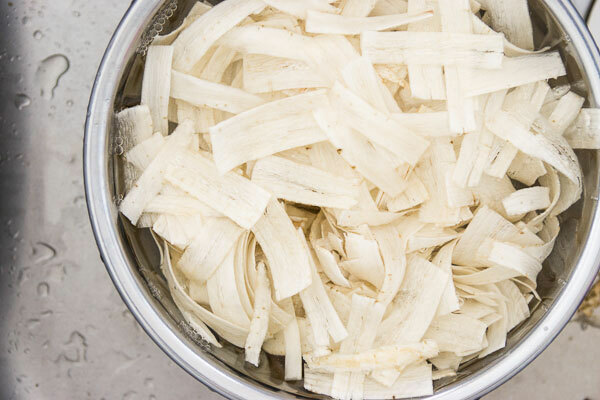 Cook the burdock for 2 minutes if you sliced it on a mandolin, or a little longer if you sliced it by hand. They should be translucent and no longer stiff, but should still be crunchy. Drain the burdock, and then put the hot burdock into the bowl with the dressing. Mix well to combine. Serve the salad warm with steamed rice or let it cool to room temperature and serve with mixed greens.